AFC Fylde have now moved to a brand new stadium at Mill Farm . In 2005 AFC Fylde purchased land in Kellemargh, Warton and began to develop the facilities. They relocated to their new ground which was purpose built to meet the requirement for playing in the North West Counties League at a cost of £150,000. The new ground was officially opened on 5 August 2006. It had an initial 207 seated main stand which cost £30,000 to build with four rows of seating and a designated Press Box area. A PA system was installed, and new floodlights are in place with other areas of the ground being developed. The ground is 3.8 miles (6.1 km) from their old council owned ground at Coronation Road in Kirkham. In the summer of 2008 on the back of the FA Vase Final a new 150 space car park was next on the agenda closely followed by a new Directors Box and Clubhouse to enhance facilities. 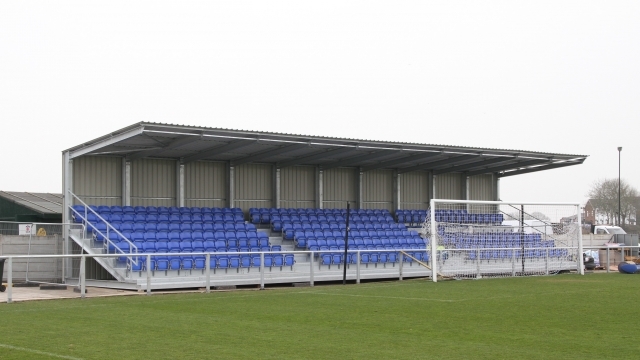 Finally an additional 75 seats were added to the stand for Ground Grading purposed in Feb 2009 taking seated capacity to 282. Further improvements were made in 2010 which saw standing capacity at 1517 giving a total capacity of 1799 at Kellamergh Park. Record attendances at the ground inclue the penultimate league clash on Saturday 9th May 2009 against New Mills which decided the Vodkat Premier Division Championship with a crowd of 1217 witnessing a thrilling 5-0 victory. Then a few weeks later on the 17th July 2009 the world famous Manchester Utd came to town with a near then capacity crowd of 1390 in attendance for a pre-season friendly against a Manchester United XI on a new playing surface which had over £30,000 spent on drainage work over the summer of 2009. In March 2010 further improvements to Kellamergh Park took place to bring the ground up to Grade D standard including a medical room, covered terrace and the full enclosure of the pitch perimeter. In July 2010 the club developed a new training facility for all teams and will allow the club to run community coaching sessions. Further enhancements to changing rooms also took place in readiness for the 2010-2011 Season. The club met with Lancashire County Council to increase the capacity of Kellamergh Park to over 1950 in 2011-2012 which was granted in April 2011. In the summer of 2012 further improvements have been made to increase the capacity and quality of facilities for Evo Stik Premier Division Football meeting criteria for GRADE C including additional terracing increasing capacity to 2250 and facilities to meet the GRADE C Standard. In the 2012-2013 Season the record attendance was beaten when FC United played AFC Fylde on Sat 13th October – 1418 attended the game at Kellamergh Park to witness a 4-2 win for the Coasters. The most recent improvements to Kellamergh Park were made during the latter part of the 2014-2015 season, as the requirement for the league was 500 covered seats, which were installed in late March 2015 and situated at the south end of the ground behind the goal. Along with the added seating, the Conference Premier requires the installation of new safety barriers in and around the ground and in particular upgrading the perimeter fencing which was completed at a similar time.